It was love at first sight. The beautiful white buildings sat, bright and welcoming, overlooking the property's rolling 23 acres as we turned into the gravel driveway. 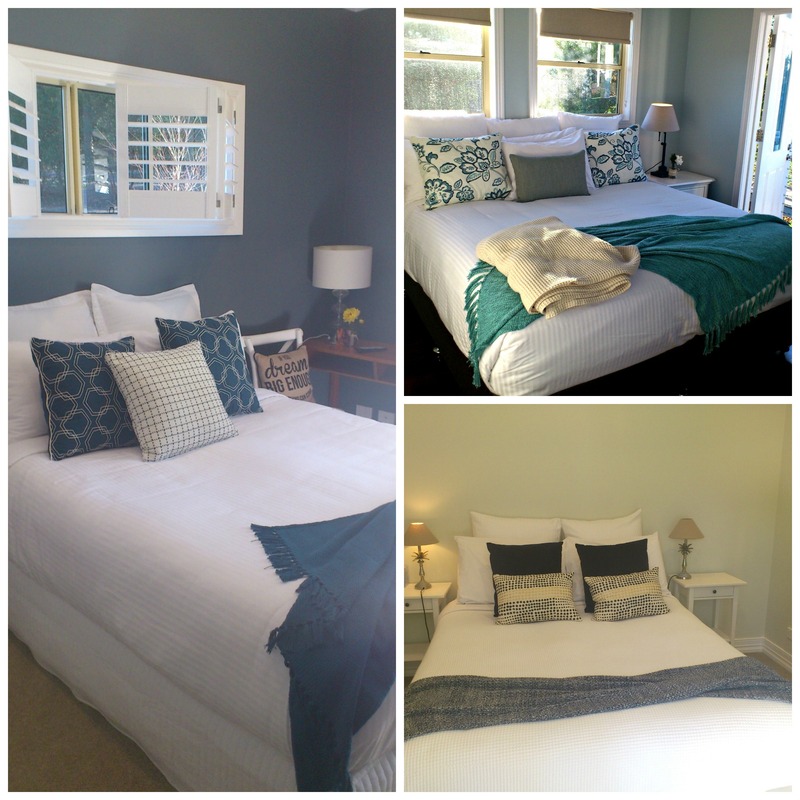 The Farmhouse Eumundi promised escape, luxury and relaxation, and I can tell you from my own experience that this is a place that more than just delivers on those promises; it defines them. We were greeted warmly by our lovely hosts, Ela and Brian Chamberlain, and Ela showed us to our accommodation in The Guesthouse, the second of the accommodation buildings on the property. The Guesthouse is home to the sumptuous King suites, Ninderry and Eerwah, each with a separate bedroom with king-size bed, a pull-out double sofa bed in the elegantly furnished living area, luxuriously appointed bathroom, bar fridge, microwave and tea and coffee making facilities. The Guesthouse also features an enormous high-ceilinged living and dining space that can be shared when the King suites are booked together. A large verandah runs across the width of this building, with gorgeous views over the surrounding countryside, and a small walkway at the front of the building takes you to a private rotunda. Ela showed us around, pointed out features, explained how things worked and then left us to settle in with a welcome platter, which we duly took out to the verandah, along with our champagne, to enjoy in the afternoon sunlight and fresh air. This was, after all an opportunity for a girlie catch-up with an old friend, and never has a catch-up been enjoyed in more beautiful or serene surroundings. 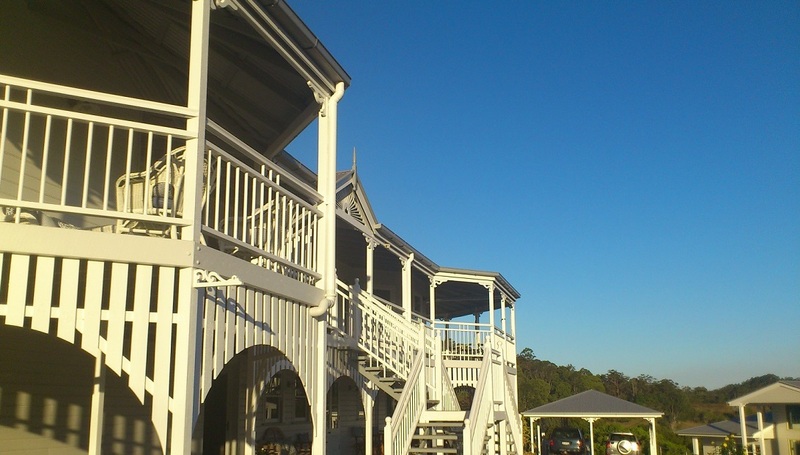 The main building is in the Queenslander style, with signature wraparound verandahs and double entry staircase. It evokes a sense of place and time, fitting well within the prevailing historic architecture of the surrounding Eumundi area. Upstairs at The Farmhouse, as this building is called, is home to two private Queen rooms, The Noosa and The Cooroy, each with its own bathroom, desk, TV, and access to the back verandah and rotunda overlooking the shimmering pool. There is also a welcoming open living and dining space, as well as a huge kitchen where Ela whips up her legendary breakfasts from organic, locally-sourced produce. Here everything is flawlessly decorated in Hamptons style. What is it about Hamptons style that just whispers "Relax"? At The Farmhouse muted blues, greys and greens contrast with crisp whites, classic timber furniture, plump pillows and cosy throws to create a home-away-from-home haven with a focus on space and comfort. These interiors are sophisticated, elegant, cheery and welcoming at the same time - the perfect background for an escape from the every day. You can mix with other guests if you want or enjoy a host of private spaces for quiet contemplation. Downstairs in the main building you'll find the Farmhouse Retreat, a two bedroom self-contained apartment, complete with full kitchen and its own pretty, covered seating area overlooking the tennis court. Yes, I forgot to mention the bold blue tennis court adjacent to The Guesthouse, where you can practice your backhand if you're feeling energetic. The tennis court is edged by garden beds, that were profuse with yellow roses (my favourites) on our visit. After much talk, laughter (and champagne) on our verandah late in the afternoon we wandered down to meet up with Brian and Ela for animal feeding time. 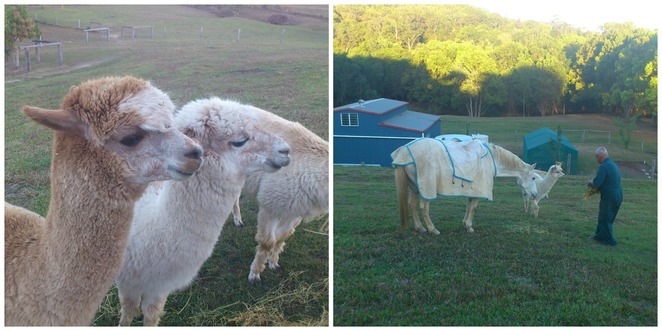 This is an afternoon ritual where you'll meet Spot, the horse, and 'the girls' - alpacas Golda, Aussie and Kaspa - and you can participate in the feeding if you like. Ela explained what to do when you meet an alpaca (who knew there was such a thing as alpaca etiquette?) Don't look them in the eye, bow your head down towards them and proffer the food. Once they nuzzle your head you'll know you've been accepted. This was a lovely experience, that would be enjoyed immensely by children. Talking with Ela and Brian about the animals, and about their life at The Farmhouse we felt part of the family, and this is when you appreciate that beyond the beauty of the place, beyond its comfort, elegance and attention to detail, the real secret ingredient of its success is Ela and Brian themselves. Their decades of experience in resort and property management around the world is evident in a host of little touches that elevate this experience to the ultimate in getaways. At our invitation, Brian and Ela joined us for a drink on the verandah of The Farmhouse as we watched the sun set and enjoyed the cooling afternoon. We chatted about some of their experiences in the world of hospitality and what had brought them here. Ela and Brian are the perfect hosts. They quite obviously love their jobs and have a real interest in people. That kind of friendliness and genuine warmth can't be faked and I have to say that they provided the best service I have ever received at a B & B establishment. That service extended to a recommendation for dinner at Il Mio Posto (an excellent Italian restaurant, just down the road in Eumundi township - highly recommended), together with an offer to drive us there. And it continued with the magnificent breakfast we enjoyed the next morning on the spacious verandah of The Farmhouse. Ela had asked about our food and timing preferences the night before so, after a restful night's sleep in a comfy bed and a warming shower in the well-appointed bathroom, we took the very short walk up to the Farmhouse for a caffeine hit and breakfast. And what a breakfast it was. You only live once, so we had the works. First, we chose from the yoghurt, fruit, cereal and juice laid out on the pristine tablecloth while Ela bustled in the kitchen. Ela knows a thing or two about cooking, having worked alongside and learned from some famous chefs in her previous roles managing five star resorts. Our breakfast arrived on a platter groaning with smoky bacon, poached eggs, sweet tomatoes and fried potatoes. It was delicious, and we lingered on the verandah for quite some time, enjoying the food, the glorious spring morning and the general ambience. What a treat. I had very high expectations of my stay at The Farmhouse Eumundi. Not only did the photos and descriptions on their website look beautiful, but I could not find a single review on their Facebook page or any review site that was less than five-star perfection; not one. What an amazing feat, which is reflected in the fact that they have just become one of only 6 businesses on the Sunshine Coast to have been awarded the 'Tick' as an Australian Tourism Accredited Business. I now completely understand all of these accolades and add my own. 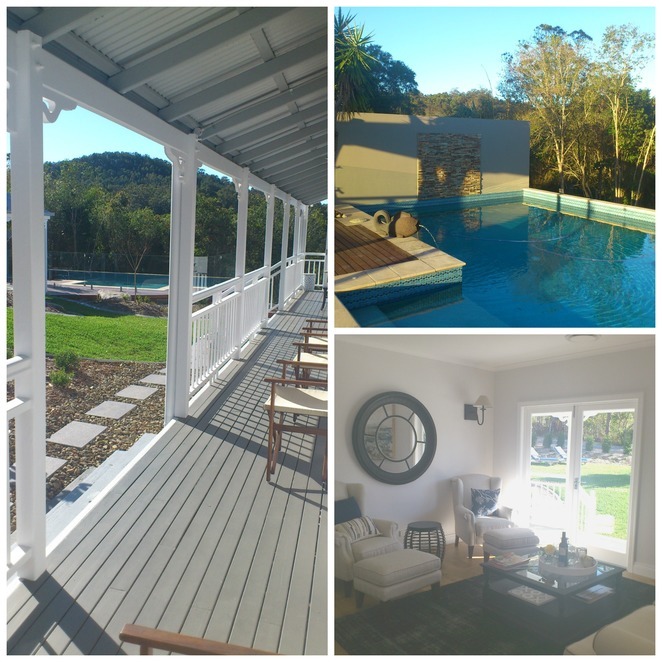 Whether you're looking for a romantic getaway or a family retreat, whether you're a holiday maker or a business traveller, The Farmhouse Eumundi has you covered. And don't think that it's just suitable for a hinterland escape. The Sunshine Coast is one of the most beautiful areas in Australia but summertime crowds can be a problem. Here you'll get the best of both worlds - cool mountain breezes and small country town ambience - only 20 minutes to Noosa Heads, Peregian Beach or Coolum. I'm already organising a time when I can make a return visit with my husband. My advice is to book now before the rest of the world catches on to this hideaway secret. Say hello to Brian and Ela and give an extra pat, and some extra food to 'the girls' for me. Check the video below for a taste of what to expect. There is a small postcript to my story that perfectly illustrates what the whole Farmhouse Eumundi experience is all about. After saying our goodbyes we headed into Eumundi to check out the famous Eumundi Markets. Ten minutes into this adventure I received a phonecall from Ela to say that I had left my satnav in my room. She insisted that, rather than stopping back in on our way home, she would deliver it to me there, which she promptly did. Enough said. Fabulous Geraldine. I am very jealous.